From the top of the green yew streaming. In the fragrant forest dreaming." 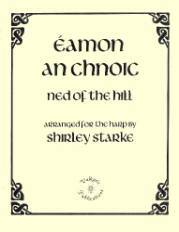 "Éamon an Chnoic," in English "Ned of the Hill," is a Gaelic song about the 17th-century Irish nobleman Edmund Ryan, who lost his lands to the English and was in exile in the mountains. In the song he comes to his sweetheart's door, cold and wet, but at first she refuses to let him in. "What can I do for you," she says, "but the hem of my gown to put over you? And the powdery snow will fall on you still, and both of us will be covered." But when he says he will go across the sea, she asks him to go with her into the lovely woods and live there forever. 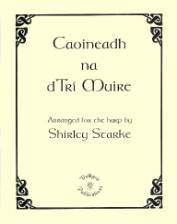 This sheet music includes both the original Gaelic words and an English translation that is very accurate, faithful to the original rhyme and meter, and easy to sing - three verses in each language, as well as the melody, chords, and arrangement for the harp. The sheet music is 8½" x 11", 4 pages, and printed in black on ivory paper. Level: easy to intermediate. $3.00. This song is about a little boat that went to sea, and neither the boat nor its owner returned. "The tiny boat, the lively boat, the pretty boat, the boat of Phelim, / The honest boat, the willing boat, the boat of Phelim, with Phelim along." 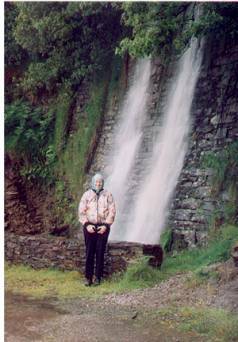 The sheet music includes the original Gaelic words and an accurate, singable English translation, as well as the melody, chord symbols, and arrangement for the lever or pedal harp. It is 4 pages, 8½" x 11", printed in black on ivory paper, with an intricate harp illustration by Celtic artist Elly Fithian. Easy to intermediate. $3.00. "O Peter, Apostle, have you seen my bright love?" "I saw him just now in the power of his enemies." The title of this song, "Caoineadh na dTrí Muire," means "Keen (Lament) of the Three Marys," but in fact it is about the sorrows of only one - the Virgin Mary - at the Crucifixion. "O who is that fine man on the tree of suffering?" "Can it be you do not know your son, little mother?" 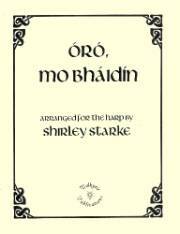 Very beautiful and deeply moving, this version includes the original Gaelic words and an accurate, very singable English translation - 6 verses in each language - as well as the melody for voice, chord symbols, and arrangement for the harp. The sheet music is 8½" x 11", 4 pages, and printed in black on ivory paper. Easy to intermediate. $3.00. Yet peace is in its lofty halls, my loving treasure store. Though autumn leaves may droop and die, a bud of spring are you. Sing hushabye lu la lu lo lan, Sing hushabye lu la lu." This lullaby is one of the oldest extant Irish songs, lulling a child to sleep with a prayer for safety against the wild weather and "Clan Eoin's wild Banshee." 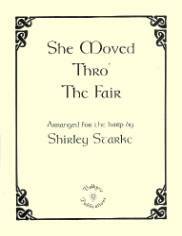 The sheet music includes words (3 verses), melody, chords, and arrangement for the lever or pedal harp. It is 4 pages, 8½" x 11', printed in black on ivory paper. Level: easy to intermediate. $3.00. And fondly, I watched her go here and go there. As the swan in the evening moves over the lake." This song combines a beautiful old melody in the Mixolydian mode with words by turn-of-the-century Irish poet Pádraic Colum. It is a hauntingly beautiful love song: the girl has died, but she comes to her sweetheart in a dream and says, "It will not be long, love, till our wedding day." The sheet music is 8½" x 11", 4 pages, printed in black on ivory paper, and includes words (4 verses), melody for voice, and arrangement for the harp. Easy to intermediate. $3.00. "Must I go bound and my love go free? Must I love a love who does not love me?" 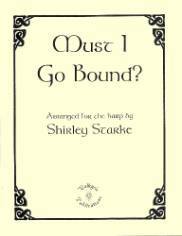 This folk song from County Wexford describes the age-old plight of the lover who is not loved in return. "...But though he's false, I must love him still." The sheet music is 8½" x 11", 4 pages, and printed in black on ivory paper. It includes words (8 verses), melody, chord symbols, and a full arrangement for the harp which combines chords, arpeggios, and counter-melody. Level: easy to intermediate. $3.00. Now at the start of summer!" 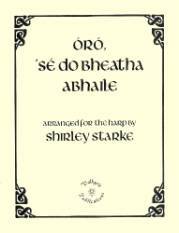 This song is about Gráinne Mhaol, or Grace O'Malley, the sea-queen of Connacht who lived in the 16th century, and it probably dates from Gráinne's own lifetime. It is a song welcoming her home after a time when she was held captive by the English. "Welcome home, woman who was mournful. O, our grief that you were in fetters! 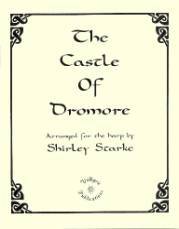 All your realm in the hands of strangers..." The sheet music includes the original Gaelic words and an English translation that is faithful to the original meaning, rhyme, and meter, and is easy to sing (3 verses in each language), along with the melody, chords, and arrangement for the lever or pedal harp. The music is 4 pages long, 8½" x 11", printed in black on ivory paper. Level: easy to intermediate. $3.00. I won't come back 'til Saint John's Eve..."
This song is a celebration of the currach, the fishing boat that is still used in the west of Ireland. 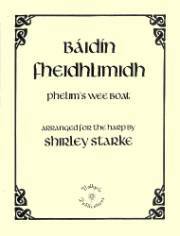 The sheet music includes both the original Gaelic words and an accurate, singable English translation. It is 4 pages, 8½" x 11", printed in black on ivory paper, and includes words (3 verses in each language), music, chord symbols, and an arrangement for the harp that does justice to its lovely melody. Level: easy to intermediate. $3.00.